Anger can be a destructive emotion. When you’re angry, adrenaline glands fill your body with stress hormones, like cortisol and adrenaline, and your sense of reasoning decreases. Anger usually causes your heart rate, respiration and body temperature to increase. The effects of anger can affect your health in various ways. Additionally, individuals dealing with an anger disorder, like intermittent explosive disorder, often have trouble forming and maintaining relationships. Fitness activities, like CrossFit or running, can help people better manage anger. If you’re dealing with anger problems, engaging in a form of exercise can help clear your mind and increase your focus. Many different exercises can combat the effects of anger. Studies have found that physical activities — like boxing, CrossFit and weightlifting — can reduce stress and anxiety that contributes to anger. You could also consider participating in a recreational sports league, which can help you commit to regular exercise. 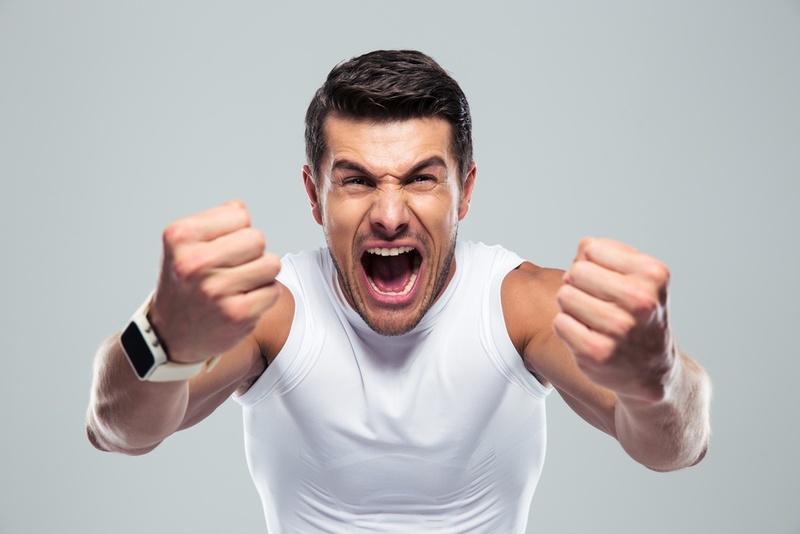 How does exercise decrease anger? Physical activity has many benefits on your physical and psychological health — even though exercise can be strenuous. Fitness affects brain functioning and can reduce anger in several ways. Whenever you need an emotional lift, exercise can help. Physical activity releases endorphins in the brain, which reduces your perception of pain and elevates your mood. The positive feeling produced by the release of endorphins contributes to the high people feel after exercising. Even small amounts of fitness can boost your mood. A report by The New York Times found that people who exercise at least once per week or for as little as 10 minutes per day are often more cheerful than those who do not engage in physical activity. Stress often breeds anger. Anger caused by stress can cause you to become irritable, argumentative or even violent. Unmanaged stress can exacerbate anger problems and lead to chronic stress, which can result in anxiety and a weakened immune system. According to Mayo Clinic, exercise is an effective outlet for decreasing stress. Additional research shows that moderate levels of physical activity can break down stress hormones in the body, which can create a sense of calmness. Researchers at Princeton University examined the role of exercise on the mind. Their report showed that physical activity produces vibrant new brain cells that can mentally stimulate or calm individuals. So by keeping active with regular exercise, you’re reducing the chances that you’ll experience anger in your everyday life. When you’re calm, you’re less likely to experience anger. A range of exercises can have a calming effect on someone’s mind and reduce their chances of feeling angry. These activities can include jogging, lifting weights or engaging in CrossFit. Multiple studies show that mindfulness activities, like yoga, can help individuals control their anger. An improved self-esteem can allow people to be more social, meet new people and spend more time engaging in enjoyable activities. Living an active lifestyle that involves regular physical activity can lead to improved self-confidence. Poor self-esteem can contribute to anger problems. Exercise has been shown to help people lose weight and build muscle, which contributes to better self-esteem. Having a positive view of yourself can increase confidence and decrease negative emotions, like anger. Anger is closely associated with drug and alcohol use — especially among adolescents. A 2017 study published in the Journal of Child and Adolescent Substance Abuse examined anger as an indicator of substance use among teens. The report showed that adolescents who exhibited high anger during baseline evaluations had an increased risk of relapsing on drugs or alcohol, engaging in violence and experiencing delirium tremens. Teens and adults who deal with anger disorders may turn to drugs or alcohol to control their rage. For example, alcohol and prescription painkillers can sedate the body and temporarily reduce stress. However, people can become addicted to these substances. A substance use disorder can exacerbate anger and lead to many other health problem, like cardiovascular disease and mental illness. If you’re experiencing a substance use or mental health disorder, treatment may be needed. With safe and secure locations throughout the United States, The Recovery Village employs addiction experts who use evidence-based techniques to help you better manage addiction or mental illness. Learn more about the benefits of treatment by contacting The Recovery Village today. If you do not struggle with substance use but experience an anger disorder, consider therapy. Through therapy, you can learn ways to better manage your rage and how to avoid triggers that can lead to angry outbursts. Seeking treatment for your anger disorder can help strengthen your relationships and your ability to meet new people.